After becoming friends with one of blogging's most skincare obsessed, I have hopelessly fallen into a skincare frenzy in which I myself have begun an obsession with refining and perfecting my skincare routine. Skincare is something that is super important to me, especially because my skin is so oily and prone to acne, I really like to take the steps to ensure my skin can look its absolute best. So here's a selection of products I'm using on my face at the moment! Starting off with a cleanser, I'm currently obsessing over the Kate Somerville Detox Daily Cleanser, which foams up into a nice lather on my skin. I prefer cleansing products that lather as I feel like it's really working into my skin and working out pulling out the impurities. The cleanser also has a nice, refreshing Tea Tree smell that doesn't overpower the senses. The Mario Badescu Glycolic Acid Toner is something that I had researched for a while before purchasing. Glycolic acid is a natural exfoliator that can remove dead skin cells, smooth your skin texture and combat wrinkles. Unlike salicylic acid (which works for your skin as long as you use it), glycolic acid will help improve your skin texture over time. The Benefit Puff Off! Eye Gel* has been a firm favourite in my skincare for the last six months. I love the way it hydrates my under eye area, priming it perfectly for makeup (and sleep!) I'm only starting to run low on it now, so I would say this little tube of goodness can last a lifetime! (Well six months at least). For a long time I struggled with facial moisturisers as I felt I could never find the perfect one to suit my overly oily skin. That was until I met the Mario Badescu Oil-Free Moisturiser and my life changed forever. This moisturiser has no gimmicks, no fancy packaging or smells. It's just good at what it's supposed to do. It leaves my skin mattified yet moisturised and I love it so much that I can't even properly express how impressed I am by this product. One of the precautions when using glycolic acid in your skincare is to make sure you wear a good sun cream. I find the La Roche-Posay Anthelios XL Fluid Extreme 50+ super light to wear on a day to day basis and I like to mix in a few drops of this in either my moisturiser or primer. This particular formula is made for those with oilier/acne prone skin and although I don't find it greasy to apply, it does leave my skin looking quite dewy. I don't mind this as I usually wear it during the day as I don't really have a need to be wearing SPF 50+ at night! It's not a complete 'set in stone' routine as I am still looking for a few select products- namely a great face scrub and a topical ointment for my breakouts. If you have any suggestions please let me know in the comments down below! What's in your skincare routine? Thanks lovely! I also really like to use a thick layer of it under my eyes as an under eye mask too- it absorbs like crazy! Definitely check out the KS stuff- they have an entire range for all skin types! I neeeed to try more from Mario Badescu! I absolutely love the Facial spray - I just repurchased today! The toner and moisturiser both sound amazing. Ooh, I'll have to look at the facial spray! Thanks for the tip hun! I'd like to try Mario Badescu toner! Have a fantastic week! Totally loving it at the moment! Thanks love, you too! Cool products, would love to try them !! chk out my fashion and lifestyle blog !! Reading this post reminds me that I really need to get off my lazy arse and write my skincare routine too. LOL! 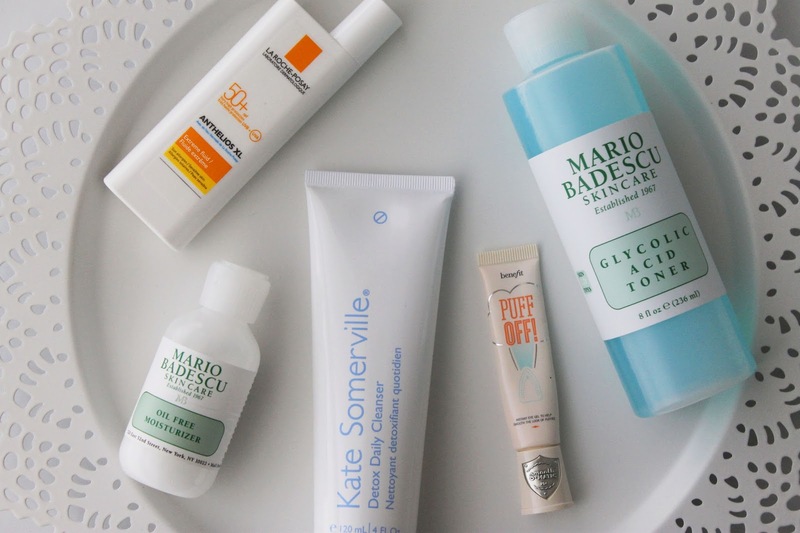 I have read a lot of good things about Mario Badescu products but I personally never tried anything myself. I do like the sounds of the toner though, might pick it up for myself soon. OOh, definitely give them a go, I know I want to try out more in the range too! 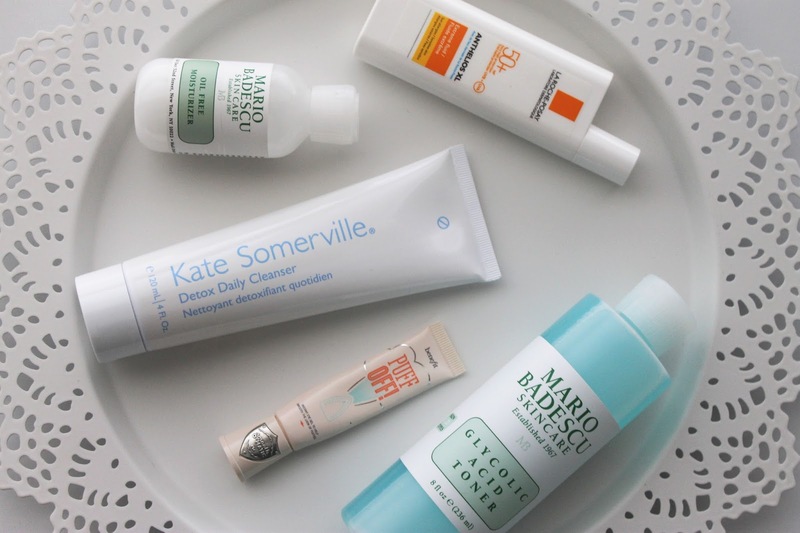 I loved the MB products for a while, but then my skin started to react to it badly. I had to stop using it. Aww no! Hopefully it won't happen to me- what reaction did you get? Great post. I must try the Benefit eye puff off. My skincare favourite is Clinique's Moisture Surge Gel moisturizer. It is amazing! Great post! It's nice to now what works or doesn't work for others. Thanks Alyssa! They do have some fabulous products! Definitely agree with you Krissie! It's so important to start a great skin regime while you're still younger! Some amazing products here! Lovely post! I've been interested in the benefit puff off for a while now and I may have to try it out. I just discovered LaRoche Posay and I can see what all the hype is about. I use the Micellar Water and the Hydraphase UV Intense SPF 20. The SPF is really light and has a cooling sensation, which is heavenly on a summer morning.